The Immaculate Conception of Mary means that unlike all other women, Mary is born without original sin. She is meant to be a second Eve who will undo the work of the first one. Why did Mary have to be a second Eve? What is original sin? These questions lead us back inevitably to the very first pages of the Book which Jews call the Hebrew Bible and Christians refer to as The Old Testament. On the first day, God created light, and thus Day and Night. On the second day, he created the firmament, which He called Heaven. The third day, He created land, called Earth, endowed with plants, flowers and trees. Let us make a human in our image, by our likeness, to hold sway over all things... And God created the human in his image, in the image of God He created them; male and woman, he created them. After surveying his work,the Lord called it very good and rested. 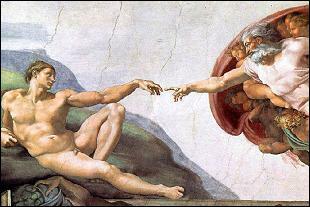 Man and Woman, soon to be called Adam and Eve, were meant to be the apex of God�s Creation. Our first parents were meant to spend their lives pleasantly in Eden, masters of the Earth and companions of God. But... as we will see tomorrow there is a serpent in Eden.